You'll be £14.99 closer to your next £10.00 credit when you purchase Raiders from the Sea. What's this? The Special Boat Service was a small force during World War II, never more than about 300 men. But that did not stop it from inflicting great damage on the enemy. In the Mediterranean arena and in the Aegean, which the Germans controlled after the fall of Greece and Crete, this small commando force kept up a constant campaign of harassment, thus pinning down enemy forces and preventing their joining other fronts. They travelled by night to their targets, using submarines, small surface vessels or canoes, with the commanders of the vessels often putting themselves in danger in order to help the men carry out their dangerous and secret missions. They were reliant on the co-operation of the fiercely independent Greeks and in particular the Cretans, all working together in their common objective against the German invaders. John Lodwick took part in the SBS Mediterranean campaign and writes from personal experience with the panache and verve of the squadron itself. For it is more than the story of the remarkable men who made up the force: men such as Anders Lassen, ‘the Dreadful Dane’ who was awarded a posthumous VC, Fitzroy Maclean, Eric Newby, Jock Lapraik, and Lord Jellicoe, who commanded the squadron for almost two years and who contributed a memorable foreword to this memoir. 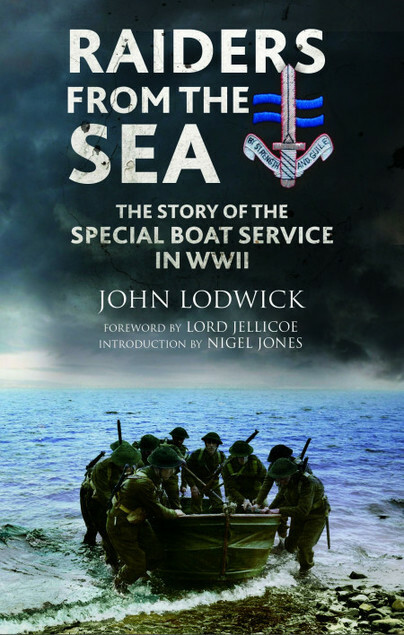 Strong, determined individuals, together the men of the Special Boat Service formed a deadly, cohesive fighting force which contributed much to the war in the Mediterranean and to whom John Lodwick’s book is an excitingly readable tribute. Reprints like this are so valuable, let there be more of them. The heroes of these stories deserve such memorials. Lodwick - he ex-French Foreign Legion and ex-SOE before joining the SBS - closes with some reflections on war, by one who had seen rather a lot of it. This is an excellent read. It is about a little-known subject of the war, a small unit but an impactful and fascinating one. I would recommend this to both the history expert, as it provides a great first-hand response and understanding of the challenges and realities facing real individuals, but also for general interest as it is incredibly fascinating, easy to understand and enjoyable. Would 100% recommend, absolutely loved it. The story of this crew of eccentric, often weird, but sublimely brave and resourceful individuals is skillfully woven...Reprints like this are so valuable, let there be more of them. The Special Boat Service was a small force during World War II, never more than about 300 men. Strong, determined individuals, together the men of this elite commando unit formed a deadly, cohesive fighting force which contributed much to the war in the Mediterranean. This reprint edition is a vivid account of one man’s experiences of war – and a fitting tribute to the colleagues he fought alongside in the SBS. John Lodwick (1916-1959) was one of the leading novelists of the early twentieth century and a key player in London's surrealist movement. This memoir covers his wartime experiences in the SOE and the Special Boat Service. He died in a car crash in Spain, alongside his publisher, at the age of just 43.